You are currently browsing the BestOfBothWorldsAZ.com blog archives for April, 2014. The free-radical theory of aging (FRTA) states that organisms age because cells accumulate free radical damage over time. You may believe that you are getting enough antioxidants via diet, you may be wrong. As I learn more about the benefits of resveratrol, I am convinced that a nightly application of an effective topical resveratrol product needs to be a part of everyones skin care regimen. Resveratrol is a botanical antioxidant with diverse biologic effects important to anti-aging. Resveratrol is a natural polyphenolic antioxidant found in over 70 plants, including berries peanuts and grapes. It protects plants from stress, UV light and certain fungal infections. You may have also heard that red wine is a good source of resvertrol, this is because it is in the skin of the grapes and as the grapes ferment the concentration of resveratrol increases. A free radical is any unstable atom or molecule that is missing an electron. They stabilize by steeling an electron from another molecule, which then becomes becomes another free radical, creating a chain reaction. Free radicals can be intrinsic (natural) or extrinsic (environmental). Extrinsic free radicals (from your environment) can be ingested, inhaled or absorbed into the body. UV rays, air pollution, tobacco smoke, herbicides, and pesticides are all forms of free radicals. Intrinsic free radicals (natural) occur constantly when our body produces free radicals as by-products of a basic metabolic process called oxidation. Immune cells will also release free radicals in order to fight invading viruses and bacteria. Exogenous antioxidants are obtained from an outside source such as diet or topical applications, compared to Endogenous antioxidants which are made by the body. The body makes five types of endogenous antioxidants: superoxide dismatuse (SOD), alpha lipoic acid (ALA), coenzyme Q10 (CoQ10), catalase and glutathione peroxidase. The body is incapable of producing enough endogenous antioxidants to combat free radicals on their own, so it is essential to get additional (exogenous) antioxidants through diet. We can increase exogenous antioxidants by eating a healthy diet, but this does not exactly increase endogenous antioxidants. Unfortunately, as we age the body produces less endogenous antioxidants. Evidence suggests that a decrease in endogenous antioxidants plays a role in both extrinsic (environmental) and intrinsic (natural) aging, leading to premature aging. So…this is where resvertrol comes in to play. Resveratrol helps to up regulate endogenous antioxidants, including superoxide dismatuse (SOD), catalase and glutathione. Skin aging is effected by the depletion of naturally occurring (endogenous) antioxidants. Another driving factor in skin aging is ROS (reactive oxygen species), which can result from environmental insults such as sun exposure as well as the disturbances in mitochondrial function. Increased ROS can directly damage cell membranes, proteins, DNA as well as turning on the cellular and molecular mechanisms that accelerate aging. This means a break down of collagen, less collagen production and increased inflammation. Studies show that resveratrol down regulates this process, helping to preserve collagen and reduce skin inflammation. Orally ingested resveratrol is rapidly metabolized, leaving only a small fraction to reach tissues. Resveratrol ingested via diet or supplements is not the most effective way to deliver it to the skin, topical applications are more promising. Topical resveratrol is applied directly to the targeted area allowing skin tissue to attain a therapeutic concentration. The first challenge with topical resveratrol is that it is photosensitive, so it must be protected by a broad-spectrum sunblock or used exclusively at night. The second challenge is that it has a low water solubility, making it hard to get high concentrations of pure resveratrol in a topical solution. This explains why most topical products have less than 1% of pure resveratrol. Finally, the transport of resveratrol to the skin is limited by the type of vehicle used. It is essential that the resveratrol be able to escape from its vehicle and be able to penetrate the initial barrier. Renowned for their topical antioxidant serums, it is no surprise that Skin Ceuticals would overcome the obstacles of topical resveratrol. 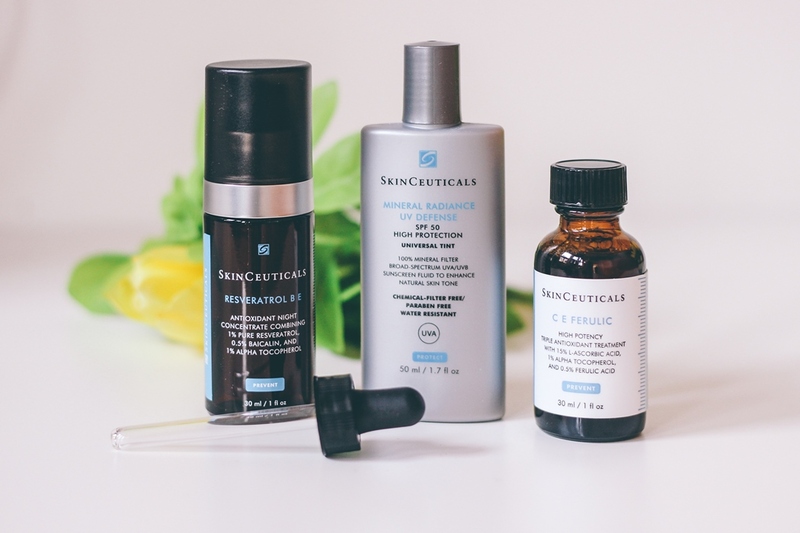 Skin Ceuticals has created “Resveratrol BE” with a maximized concentration of 1% pure stabilized resveratrol in a synergistic formulation with 0.5% baicalin and vitamin E for enhanced efficacy. Skin Ceuticals advanced research labs have formulated the resveratrol in a delivery system of hydrotopes which allow the resveratrol to penetrate the skin. Remember resveratrol works synergistically with other antioxidants and it is degraded by UV rays. I recommended that in the morning you apply a topical antioxidant such as CE Ferulic along with broad spectrum sunblock. Apply topical Resveratrol BE at night before any moisturizer or creams. If you use tretinoin (Retin-A), apply the tretinoin first then the resveratrol.